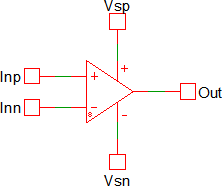 The Multi-Level Parameterized Operational Amplifier has two levels: 1 and 2. Level one models an idealized operational amplifier where both the gain-bandwidth product and the output characteristics are idealized. Level two adds output limiting on both the source and sink currents and the saturation voltages, as well as slew rate limiting and gain-bandwidth product. The level two model has dominant pole feedback with a single pole, there are no high frequency poles. This symbol and editing dialog was introduced with version 8.0. While the model will simulate in versions prior to Version 8.0, the parameters will not be editable with the double click pop-up dialog. 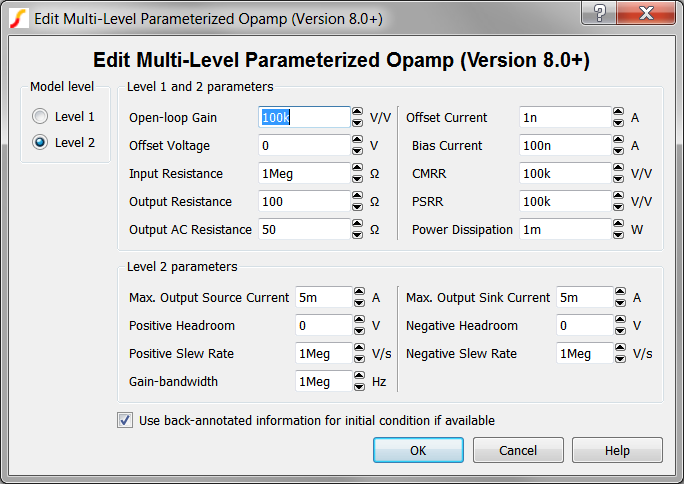 The obsolete opamp symbol uses the same electrical model but with a different symbol and editing dialog. Output AC Resistance Ω AC output resistance. This resistance must be less than the Output Resistance parameter. Power Dissipation W Quiescent current is defined differently for the SIMPLIS and SIMetrix versions. In the SIMetrix version it is a constant current and does not vary with supply voltage. In the SIMPLIS version it is implemented as a resistance that is calculated to draw the specified current for a 15 volt supply rail. The test circuit used to generate the waveform examples in the next section can be downloaded here: simplis_006_param_opamp_non_inv_freq_response.sxsch. 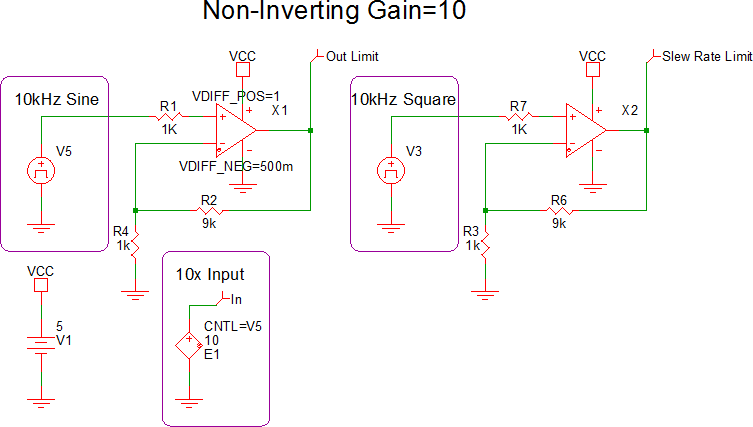 The opamp is configured as a non-inverting gain of 20dB. With an open loop gain of 100 dB and a Gain crossover frequency of 1MHz, the overall gain of the opamp is 20dB at low frequencies, with a pole at 100kHz, and a 1MHz unity gain crossover frequency. 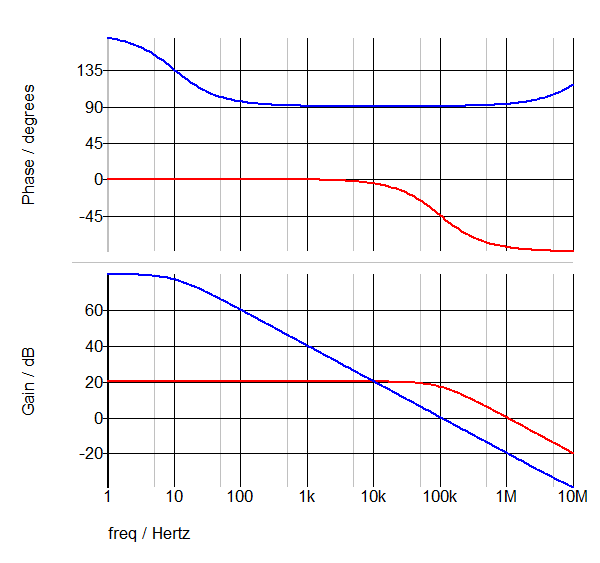 The loop gain pictured in blue has the expected maximum of 80dB and the unity gain crossover frequency is 1MHz. The test circuit used to generate the waveform examples in the next section can be downloaded here: simplis_006_param_opamp_output_sat_slew_rate_limit.sxsch. 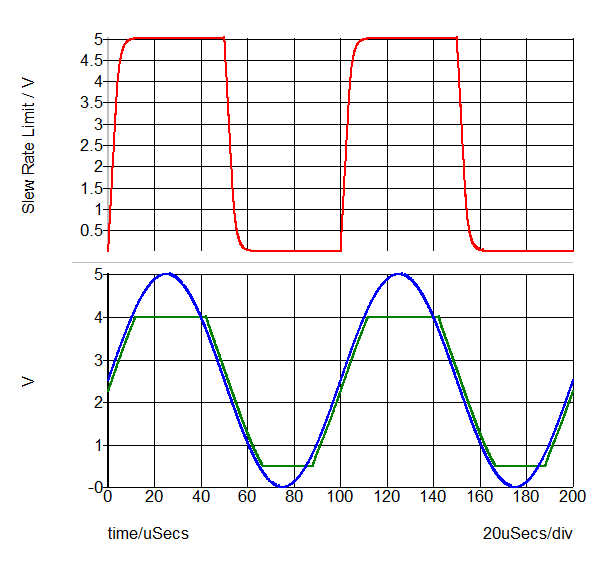 The slew rate limited behavior of the opamp is shown on the upper axis. 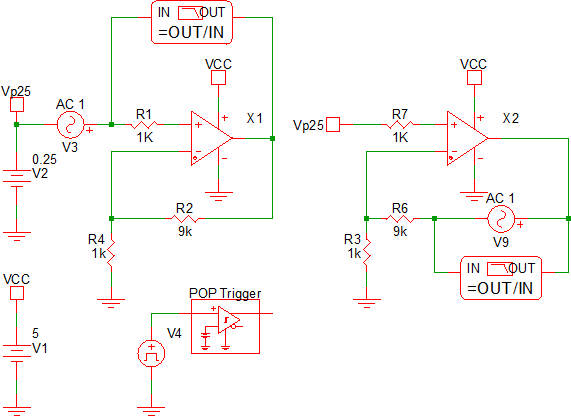 This opamp has the positive and negative headroom set to 0V, meaning the output can swing from rail-to-rail which in this circuit is 0 to 5V. The output limiting characteristics of the opamp are shown in the lower axis. The input signal is gained by 10 using a VCVS and is displayed as the blue curve. The opamp output, which is sligtly phase shifted and clamped is shown in green. The positive headroom is set to 1V and the negative headroom is set to 500mV.